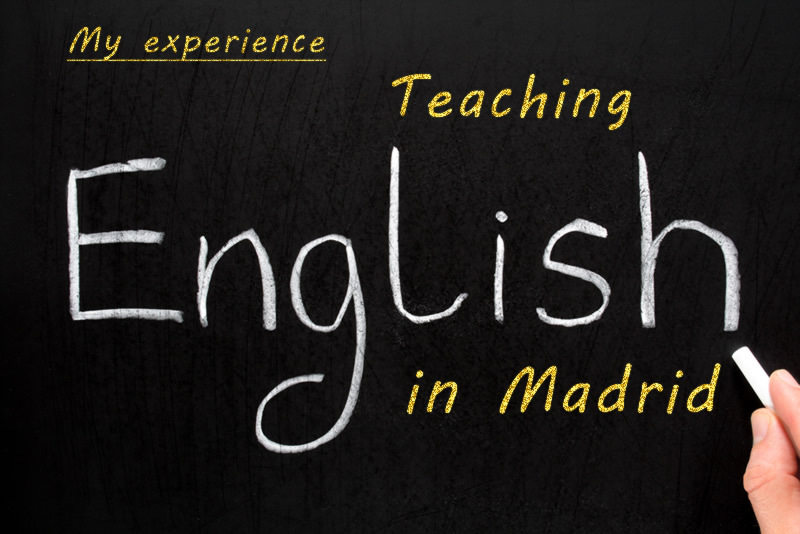 When it was first suggested to me that I write an article about my experience of teaching English in Madrid over the past thirteen years, I felt that I had so much material that not doing it was a no-no. The most important factors that contribute to the speed and efficiency of English language learning are enthusiasm, commitment and the suspension of underlying and often deeply-ingrained feelings of embarrassment. I have found this to be especially true of Spain where students put a great deal of unnecessary pressure on themselves to speak fluently right from a low level. Every mistake or correction seems to compound the untrue belief that the student knows either nothing or very little; whatever they put on their CV. Another obstacle I have encountered is that some students are particularly stuck on trying to make English work as Spanish does and have a tendency to translate literally word for word. This is particularly problematic in matters of structure and adverbs or verbal tenses and auxiliaries. But however many stumbling blocks (which can be skillfully maneuvered) there may seem to be, there are many gratifying moments when your students amaze you. They have breakthroughs of enlightenment if the concepts are explained to them in a way that they personally can assimilate. Taking the time to do this obviously means that groups must be small, and the students must open up enough and trust you to allow you to guide them along their own specific learning path. I can tell that acceptance is beginning to set in when I mention a rule with its subsequent companion interrogative response of “Is it always like that” and my answer “there are some exceptions” is no longer met by a frown. However, the adventure of discovering a new language is something I’ve faced head on from an early age and always chosen to explore. There’s nothing quite like the added confidence, admiration or simply the ability to be able to exchange ideas on a level that goes beyond rudimentary with someone from a completely different culture. In order to really understand a language deeply and have, not only the ability to build your own communication skills, but the knowledge necessary to self-correct, we owe it to ourselves to get to grips with the building blocks. All 6 areas: speaking, listening, reading & pronunciation, vocabulary, writing and yes, the dreaded grammar, must be explored once they have been broken down into digestible portions. Hiring the right teacher is highly important because a lively and imaginative teacher will keep your motivation levels high but you must be willing to repeat the teacher´s corrections and when necessary, do some outside study on your own. Unfortunately osmosis is not a viable option yet! This journey through the segments of the English language will be governed by a strategy, designed by a teacher who knows what you need because you’ve been brave enough to make mistakes. Your teacher’s role is to act as a guide who inspires curiosity that turns to excitement and thirst for more knowledge. Profesora de inglés nativa de Oxford con 13 años de experiencia en empresas. Bilingüe. Todos los niveles. Referencias disponibles.